Well we all know and have read terrestrial ecosystems in our secondary Pak. Studies books but we still know little about marine ecosystems. Hence I thought it would be interesting to discuss something new today. So put on your goggles and get ready for a swim in the cool, refreshing waters of our country and don’t forget your cameras! I guarantee you that this is going to be a memorable ride!! We will first swim in the inland water resources of Pakistan. Yep! You guessed it right! The inland water resources comprises of the Indus, Jhelum, Chenab, Ravi, Sutlej all originating in Western Himalayas and then along the flow the rivers we will drain into the Arabian Sea where we will study marine and coastal biodiversity. 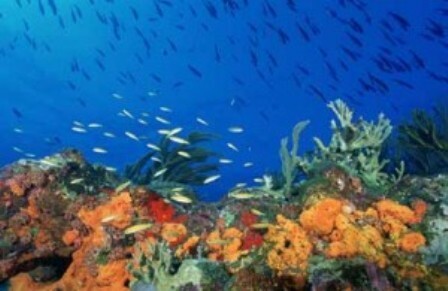 By the way, did you know we have huge deposits of coral reef here too?? Don’t worry we will give them a special visit too! Coming back to the rivers, Pakistan has 198 freshwater species of fish including 15 introduced species. The fish fauna is predominantly south Asian, with some west Asian and high Asian elements. Among these are the nine species of snow trout (sub-family Schizothoracinae) that occur in rivers of the northern mountains. These fish are representatives of an ecologically interesting group of fish confined to (only present in) snow fed rivers and lakes of the high Asian region. Species richness is highest in the Indus river system, in the Kirthar Range and in the Himalayan foothills, while the river systems of north-east Balochistan have the highest levels of endemism. Some species of fish such as Tor (Tor putitora), migrates from flood plains to the Himalayan foothills for breeding, but the construction of the Mangla and Tarbela Dams has blocked its migration. The other species is Palla (Tenualosa ilisha), which requires a 200 km northward run for spawning from the coast to theIndusRiver. The migration of this fish has been blocked by the construction of dams and barrages. Fish ladders have been provided for this purpose but they have been proven ineffective. So some of you must be wondering what fish ladders are? Worry not my friends I have got the answer right here. A fish ladder, also known as a fishway, fish passes or fish steps, is a structure on or around artificial barriers to facilitate fishes’ natural migration. Most fish ways enable fish to pass around the barriers by swimming and leaping up a series of relatively low steps (hence the term ladder into the waters on the other side. The velocity of water falling over the steps has to be great enough to attract the fish to the ladder, but it cannot be so great that it washes fish back downstream or exhausts them to the point of inability to continue their journey upriver. Coming back to the point, twenty four species of fog and toad is also found in our rivers. Talking about our rivers, how can I forget top mention our beloved Indus Blind Dolphin?? We have read about them in the spellat horns we gave when we were in school and get Rs. 100 worth goodies in return not to forget the difficult spellings we had to learn!! Aaaahh!! Good old days…. The Indus River dolphin (Plantanista gangetica minor) is one of the world’s rarest mammals and the second most endangered minor freshwater river dolphin. Approximately 1,275 specimens of this species exist today in the lower reaches of the Indus River in Pakistan. However, the population of these species has gradually declined because of various factors, including water pollution, poaching fragmentation of habitat due to barrages etc. But do not be sad animal lovers!! Irrespective of these facts active efforts are being done to conserve their population and as a result their population has increased a lot. In 2001 their population was estimated to be only 1,100 and in 2006 their number was estimated to be 1400-1600. Indus River Dolphins travel either as couples or individuals. Since these dolphins do not have a crystalline eye lens they are effectively blind; all they can do is detect the direction and intensity of light. Navigation, therefore, is entirely by a sophisticated echolocation system. This blindness is one of the reasons why these dolphins swim on one side underwater, with one flipper trailing in the muddy riverbed. The physical touch gives the dolphins important information about their surroundings and helps them find food. They feed on small fish and crustaceans. Now coming to the marine and coastal biodiversity in Pakistan.Pakistan has a coastline that stretches to over 1,050km along the Arabian Sea, 990 km when measured in a straight line. The coast of Pakistanconsists of sandy beaches that are interrupted by rocky protruding points. According to the reports available, gastropods dominate the rocky shore fauna followed by decapods, crustaceans and polycheate worms. There are occurrences of approximately twenty-one intertidal (between high tide and low tide) seaweeds. 15 green seaweeds and 6 brown red marine macro algae are found from sandy shores. Almost 800 species of marine fish have been recorded in Pakistan’s coastal water. Large pelagics (fish living in open sea) such as the tuna are common in the waters of Balochistan. Palla fish (Tenalosa ilisha) which is considered a delicacy, is an anadromous fish that swims up theIndusRiverto breed. Major fishing grounds along the coast ofPakistanextend from the Sindh coast stretching from the HubRiver to the Indian border and Bolochistan coast west of Karachito the Iranian border.Pakistanis a net exporter of shrimps, lobsters, crabs, mollusks, fish and fishing products. Our country earns a lot of foreign exchange by this. The green turtle (Chelonia mydas) and the olive ridley turtle (lepidochelys olivacea) are found inPakistan. Eight species of oyster occur here and squid are also abundant. The mangrove trees make up a whole new mangrove ecosystem and are closely related to the marine ecosystem. The mangrove ecosystems are rich in biodiversity. Eight mangrove species are reported along the the coast of Pakistan. Over 48 species of macro fauna have been reported from mangrove forests along the coast of Pakistan. The fauna consists of several species of crabs, polychaetes, mollusks etc. Last but not the least, corals. It was widely believed that corals do not occur in Pakistan. A preliminary survey of four areas of along the Balochistan coast of Pakistan found 25 species of scleractinian coral and 77 species of reef fish. 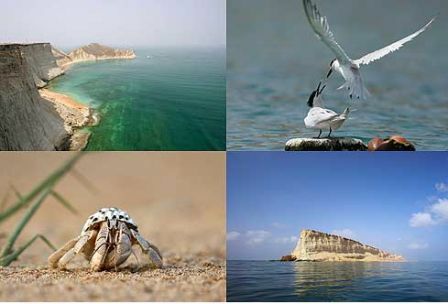 Astola (Jezira Haft Talar) Island situated approximately 37 km off the Balochistan coast stood out for its diversity of corals and fish. Soft coral such as seafan and brain coral are also present south of Astola Island. A picture belows shows the marine biodiversity ofAstola,Pakistan’s largest island. The white mountainous structures are the coral reef. Oh well, that concludes our swim in the waters of Pakistan, I hope you enjoyed it!! !